The late 1700's was the beginning of a large immigration of Americans from Kentucky and Tennessee into the Louisiana Territory. This was due in part to the fact that the Spanish allowed slavery in the territory and were also giving each settler generous land grants. 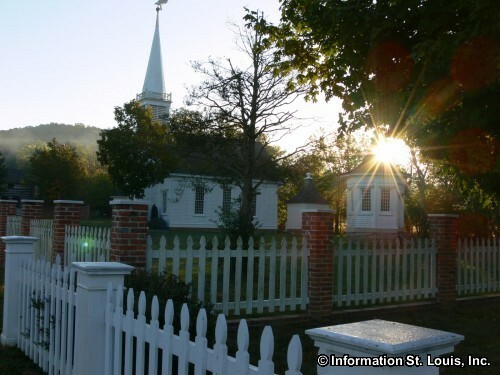 Compared to the French, who enjoyed "society" and settled in villages, Americans were independent and hardy and spread further away from St Louis and into the frontier. Many of these immigrants settled the towns of Clarksville, Louisiana, and Hannibal Missouri. So many so that the area got the nickname of "Little Dixie." The El Camino Real or "Royal Road" was a major land route, at this time, used by the French, Spanish and Native Americans to travel between St. Louis, Sainte Genevieve and New Madrid, allowing supplies and settlers to move further away from St. Louis. 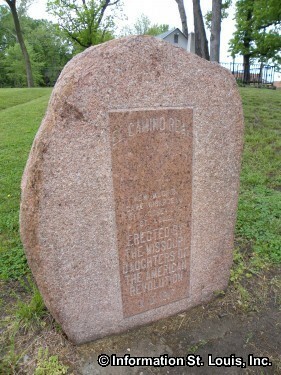 Several markers have been placed in cities where the El Camino Real traveled near or through. Those markers can be seen in Kimmswick, Sainte Genevieve, Perryville, Cape Girardeau, and New Madrid Missouri. In 1799, Daniel Boone, with much of his family, moved from Kentucky to the Spanish held Louisiana Territory and settled in the Spanish district of St. Charles. 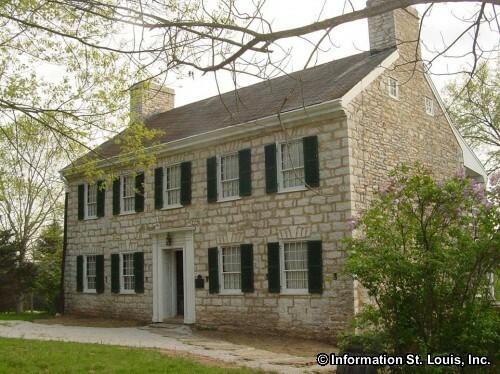 There, between 1804 and 1810, on a Spanish land grant near the present day town of Defiance, Missouri, he and his son Nathan built a large stone 4 story home. 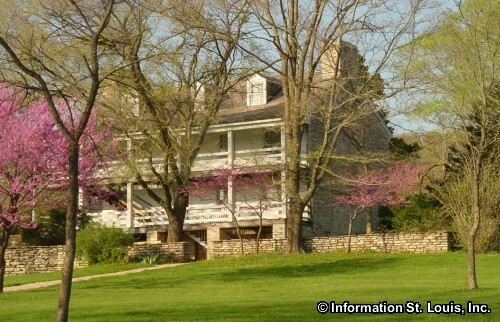 Today, the Daniel Boone Home can be toured, along with the adjoining Boonesfield Village, a collection of historic buildings representing the early 19th century, that have been reconstructed to form a living-history village. Daniel became a "syndic", which was a judge for the Spanish government, to help with local settlements in the Femme Osage Valley of St. Charles. Nathan Boone organized a troop of mounted rangers which helped defend the settlements in the Missouri frontier against Indian attacks. He and his rangers, the Missouri Mounted Rangers, helped build several forts, including Woods Fort, which was located where the present city of Troy Missouri is located now. Daniel Morgan Boone and Nathan Boone, Daniel Boone's sons, followed what was an Indian path and discovered a salt spring near Franklin Missouri. They called the salt spring Boone's Lick, thus giving the road the name of Boone's Lick Road. The Boone's set up a business and sold the salt that was harvested from the salt spring to pioneers as they came west. Before refrigeration, salt was the only means of preserving food and curing meat. It was a very important commodity. In 1827, Boone's Lick Road became an official state highway and was an important corridor of travel for over 40 years. In Franklin Missouri the trail then connected with the Sante Fe Trail that traders, with wagon trains filled with goods, used as a trade route to travel to Sante Fe New Mexico (which was in Mexican Territory at the time). 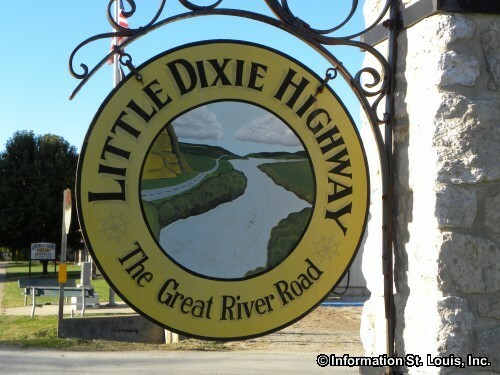 Others continued on to Independence Missouri to connect with pioneers heading west on the Oregon Trail. Those who were caught up in the Gold Rush fever would head south on the California Trail once the Oregon Trail crossed the Rocky Mountains. 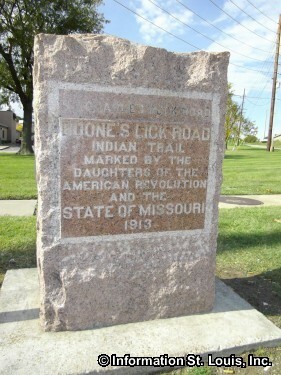 In 1913 the Daughters of the American Revolution placed markers along the Boone's Lick Road where stage coach stops, forts, outposts, taverns and other sites had been located that were important for westward travelers. Many people who came to St. Louis were just passing through and continuing on west. St. Charles Rock Road was used by many to connect to the Boones Lick Trail and then on to the Sante Fe Trail, the Oregon Trail or the California Trail. St. Charles Rock Road originally started in the City of St. Louis (east of Lucas and Hunt it is now called Dr. Martin Luther King) along what was an Indian trail. Fur trappers in 1764 extended the trail all the way to the Missouri River and called it St. Charles Rock Road.